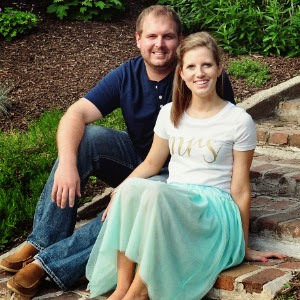 Made In The Shade Blog: Valentine Party Pinspiration! Unfortunately, I doubt my husband and I celebrate V-day very much this year. But that didn't stop me from dreaming on Pinterest. I don't think you ever really need an excuse to do that. I found some pretty cute ideas, and so I knew I had to share these with you! What is better than a warm snuggly hot chocolate party for two on Valentine's Day?! Honestly, this idea is genius. Whether you do this just for you and a special someone or for a whole room of people, a hot chocolate bar is one of the best ideas I've found! Plus, this link comes with free printables too! What a fun way to make a common decoration so unique! Plus, it seems easy on the pocket book too. 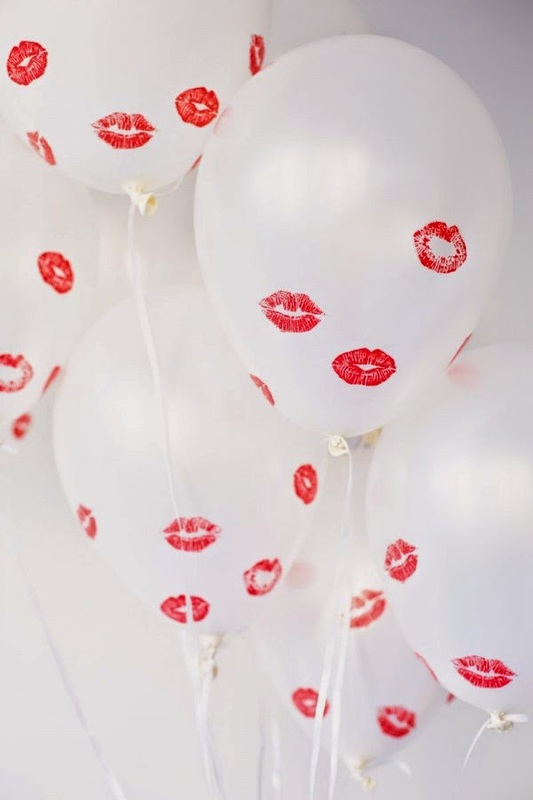 These kiss balloons would be a perfect and easy addition to any Valentine's party, or to even give to a special someone attached to a party favor! Talk about getting even easier. These heart strings are no work required and also budget friendly. 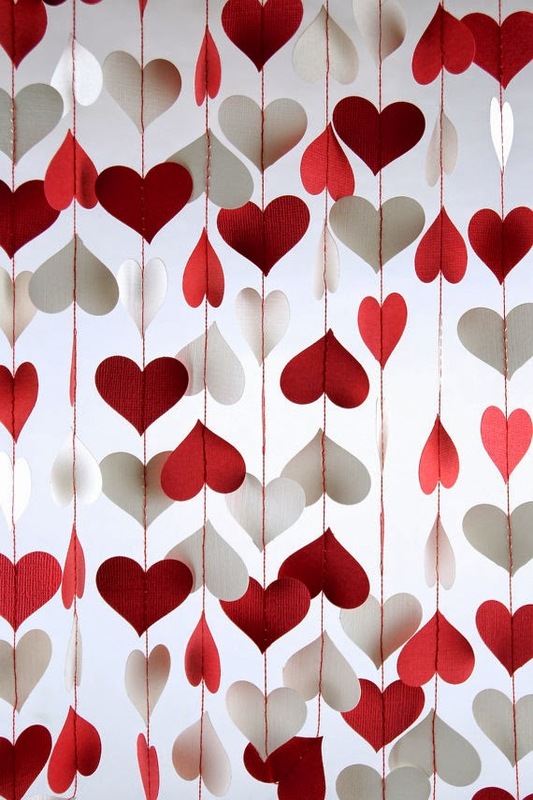 These would be great for any backdrop behind a table, DIY photo booth, or window to spice up your space for VDay. Plus, this seller has great reviews. 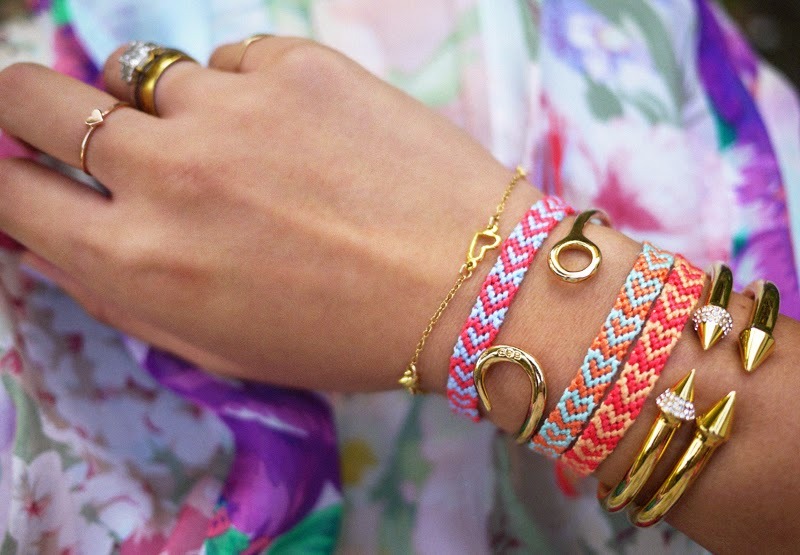 These heart friendship bracelets would make awesome party favors, and seem pretty easy to do. Plus, you can customize and make them personal to certain people. I think the girl in this photo pulls them off so great! What is a party without poppers?! 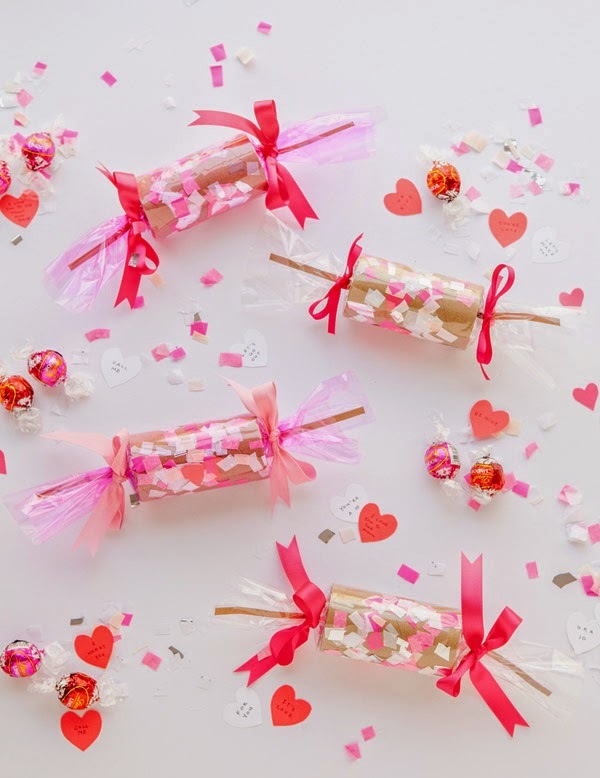 These V-day poppers are a great addition to a party - big or small, young or old. These even look fun to make to! I wonder too if these could be filled with candy surprises? Regardless, these are a definite win! I loved that this was a pink and red dessert that wasn't a cake or cupcake. It was something different and unique. But the best part is that it's low calorie and easy to do! 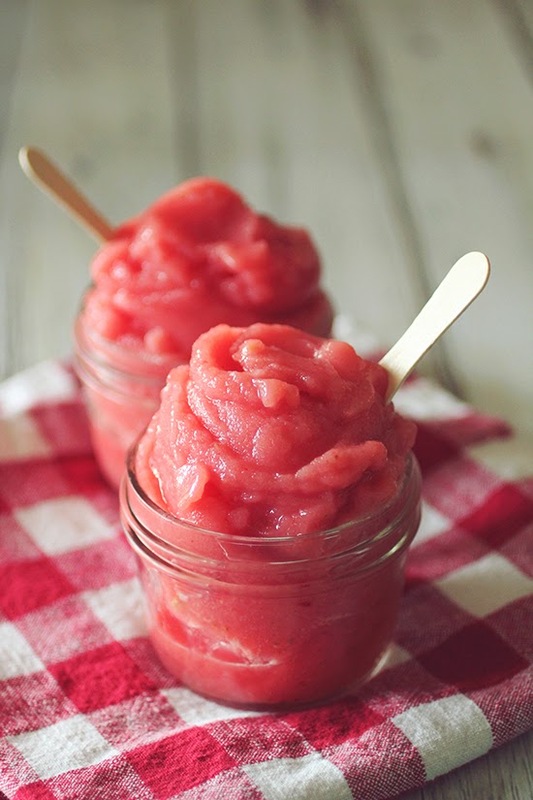 I have never made strawberry and watermelon sherbert, but now I want to for sure! I also love the little jars to serve them in! 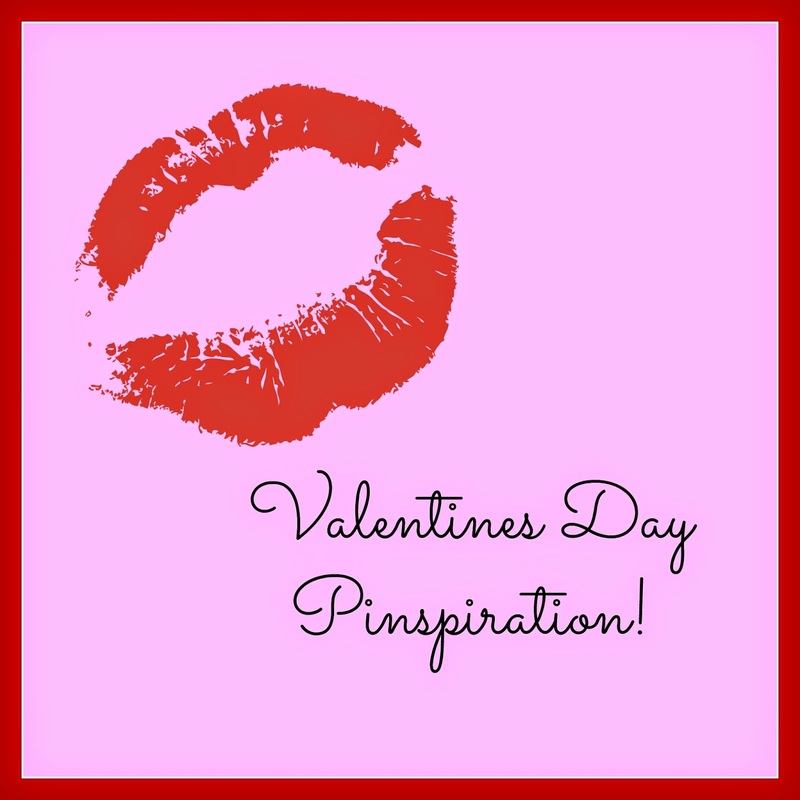 What are you using for Valentine's Inspiration? I need to make that sherbert! It sounds so good! And loving all the Valentine's Day decor! Those balloons are adorable! Well, I officially wish I was having a Valentine's Day party now. Great roundup! Love the hot chocolate bar, you could make a party just around that! Ahh all this stuff is so cute--def. getting me into the holiday spirit :) Me and the hubs do some thoughtful gift for vday instead of major shopping! You have def. given me some ideas! I am craving hot chocolate and cookies after seeing this post. The hot chocolate bar is such a cute idea! All such cute ideas! I especially love the "heart strings" and the kiss balloons - I feel like they'd be quite easy to DIY! These are the cutest pics!! Thanks for sharing! The decor is so cute!! Those balloons might be my favorite one!! Those kiss balloons are too cute! I am just hoping we are all well by V-day! 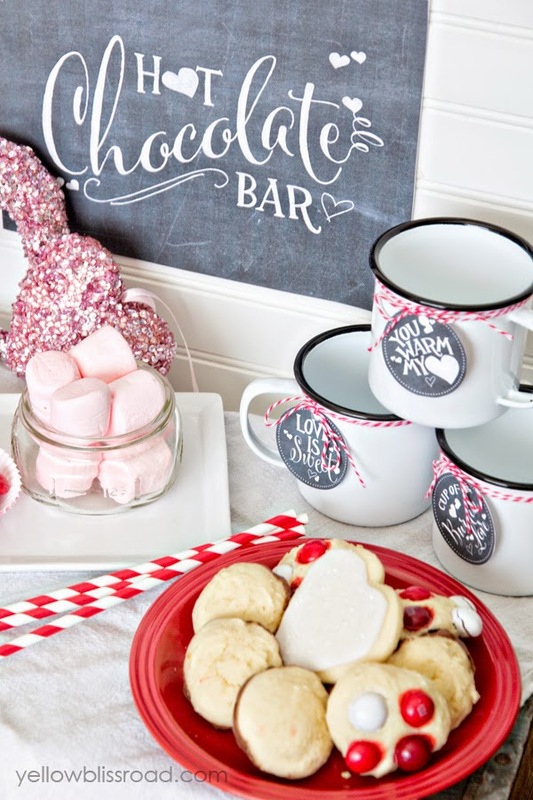 Who wouldn't LOVE a Valentine's Day Hot Chocolate Bar?! Cute ideas. So cute! This makes me want to throw a party so badly!! Also, I love your blog design! Do you mind sharing who did it? Thank you! !